I grow a basil plant on my balcony each year just so I can make my Father-In-Law's Basil Rub Chicken. 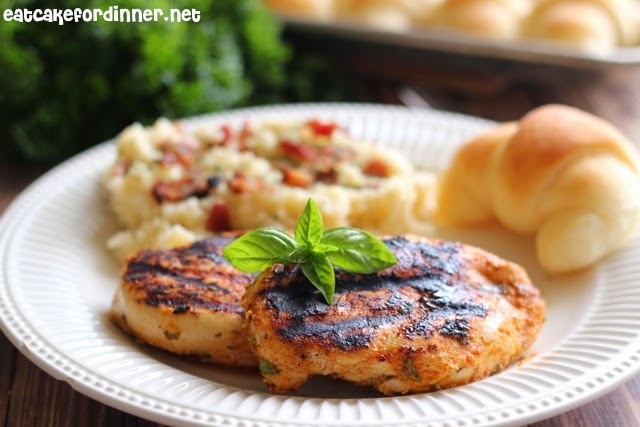 It is the most tender, juicy and flavorful chicken. Even though there is absolutely nothing to be afraid of when it comes to roasting a whole chicken, I'm sure some of you would still never attempt it (but you really should). So, here is a simplified version of Bob's famous chicken using boneless, skinless chicken breasts. These chicken breasts turned out INCREDIBLE. So so so GOOD with so much flavor and grilled to perfection. Plus, by grilling the chicken, you don't have to heat up your whole house by turning on the oven. I served with some homemade rolls and my Favorite Twice-Baked Potatoes, but instead of filling the potato shells with the mixture, I just added it all to a casserole dish, because we are simplifying things today, right? 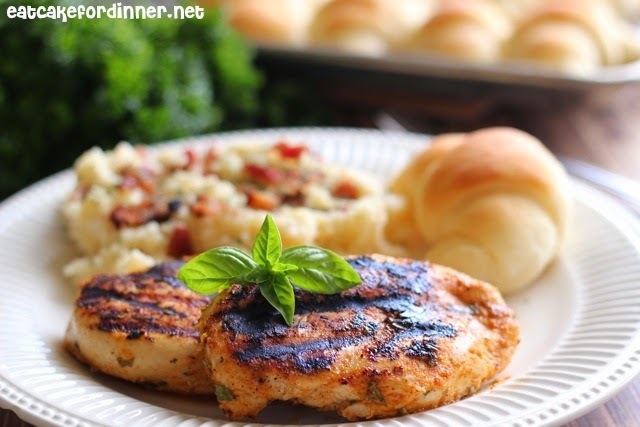 This meal is sure to impress! Combine salt, sugar, garlic powder, onion powder, paprika, ground black pepper, lemon juice, chopped basil, Worcestershire and olive oil. Stir together to form a paste. Rub mixture over both sides of each chicken breast, using every last drop of the basil rub. Place chicken in a casserole dish and cover with plastic wrap. Refrigerate and allow to marinate for at least one hour. When ready to cook, preheat the grill. I used my George Foreman Grill, but you could always use an outdoor grill if you prefer. 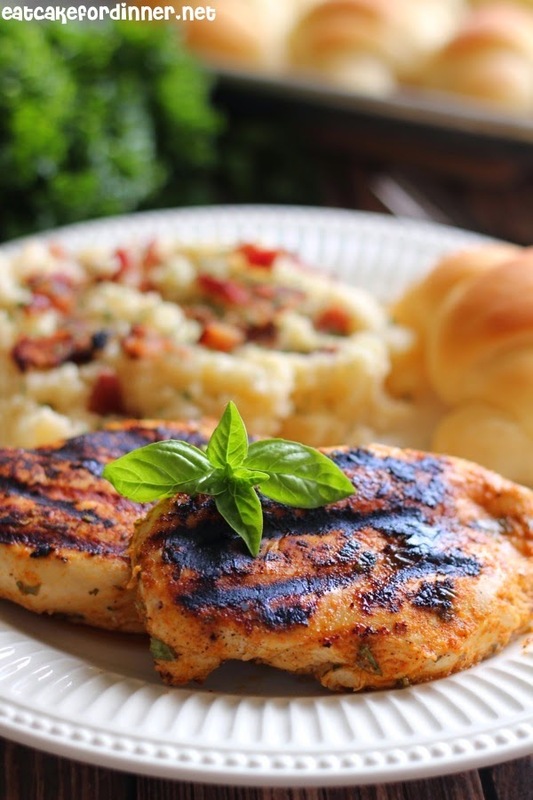 Grill chicken until internal temperature registers 165 degrees on an instant read thermometer. Serves: 4. Loving the flavors in this chicken! Bookmarked to happen soon here. i really need to grill chicken more.. this looks super delicious! We have so much basil and I need to use it more. I always use my George for grilling chicken. It always cooks it perfectly, thanks for sharing the recipe.